We’re turning 10!! Yes, the Funkya@Unkya Markets have been a feature of the mid-north Coast for 10 years – thanks to a series of hardworking volunteers, amazing stallholders, inspired musos, and the incredible community of people who come along. 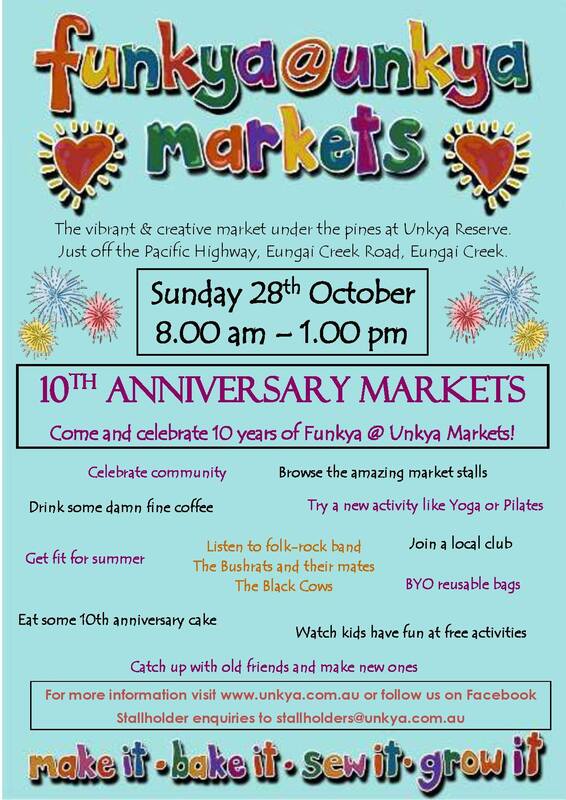 Come and celebrate at our 10th Anniversary Market on Sunday 28th October – there will be activities for you to try, clubs to join, the awesome music of The Bush Rats and the Black Cows to listen to, fabulous stalls to browse and buy from, free kids activities, a celebration birthday cake and much, much more! We have some special things planned for our 10th Anniversary market on Sunday 28 October – pilates with Soulitude Health, fitness with Kane Gois, yoga with Alexa Cummings, tae kwon do with Pierre Wilkinson, salsa dancers, a parade and maypole, the Mid Coast Lawn Mowers… and CAKE!!!!!!!! We would love everyone to come -those who’ve been coming for 10 years and those who’ve never been before!